Let's be honest, Biostar doesn't have a reputation as an enthusiast brand. Just the opposite, many people associate Biostar with budget products of dubious quality, but is that still the case? The release of yet another racing themed motherboard, this one for mini-ITX builds and filled with desirable features, has us rethinking things. So what's with the racing theme? Simply put, Biostar is trying to reinvent itself and its brand with a "race towards the future" mantra. "We have been in this business for 30 years and are looking forward to another 30 and onwards" Kevin Cheng, Global Marketing Manager for Biostar, stated in July. "We will continue to race towards the future and our consumer and partners should rest assured we are doing our best." 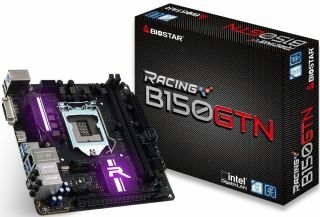 Biostar's released several racing themed motherboards for gamers over the last few months, though the new B150GTN is the first for the ultra-compact mini-ITX form factor. Like the others, it has racing stripes and customizable onboard RGB lighting, along with support for external lighting. Beyond the bling, the LGA 1151 motherboard features a pair of DDR4 DIMM slots supporting up to 32GB of DDR4-2133 RAM. It also has a single PCI-E x16 3.0 slot, four SATA 6Gbps connectors, and both U.2 and M.2 connectors (one each). You also get internal USB 3.0 and 2.0 headers, though no eSATA (for the three of you still using it). Biostar claims high quality construction on its racing themed boards, this one included. That comes in the form of 100 percent solid state capacitors, a "super durable" Ferrite choke, and a moisture-proof PCB. Finally, Biostar says it paid a lot of attention to audio with amenities like a Hi-Fi amp, Hi-Fi ground with a noise-blocking multi-layer PCB design to isolate analog audio signals from digital sources, Hi-Fi amp, and so forth. The new B150GTN isn't listed for sale yet and Biostar didn't say how much it costs. We've reached out for those details and will update this article once we hear back. Update: Biostar tells PC Gamer the B150GTN will be available at Newegg in September for $100 MSRP.